A new report by the IAF said that the Tejas fighter jet lags behind its foreign competitors like the JAS-39 Gripen. The Indian Air Force (IAF) has issued a new report listing several deficiencies found with India’s first domestically designed and produced light fighter aircraft, the Tejas Light Combat Aircraft (LCA), in yet another push to convince the government to procure foreign-made single engine fighter jets. According to IAF assessments, the Tejas LCA, when compared to Saab’s JAS-39 Gripen and Lockheed Martin’s F-16, boasts reduced airborne endurance — 59 minutes versus three hours for the Gripen and nearly four hours for the F-16. The Tejas can also only carry a weapons payload of around three tons against nearly six tons by the Gripen and seven tons by the F-16. 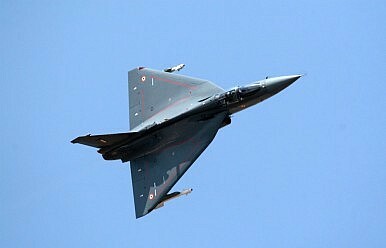 Furthermore, maintenance requirements for the Tejas LCA are also higher than with foreign combat aircraft. The Tejas LCA requires 20 hours of serving for every hour of flying against six hours for the Gripen and 3.5 hours for the F-16. In addition, the service life of the Tejas LCA is also half that of the 40 years found in both the Gripen and F-16. The Tejas LCA is a supersonic, single-seat, single-engine multirole light fighter aircraft that has been under development since 1983 by the Aeronautical Development Agency in cooperation with Indian state-owned military aircraft maker Hindustan Aeronautics Limited (HAL). HAL has repeatedly stated that it intends to address the technical shortfalls. In May 2015, the Comptroller and Auditor General (CAG) of India — the Indian government’s principal oversight body —issued a report highlighting technical problems with the Tejas LCA, including inadequate electronic warfare capabilities, problems with the onboard radar system, and reduced internal-fuel capacity. The shortcomings are expected to be tackled in the upgraded Mark I-A variant of the LCA, which was slated to take to the skies for the first time this year. The upgraded LCA will be fitted with an advanced AESA radar system and a new electronic warfare sensor suite, among other thing. The IAF also wants to arm its Tejas fleet with I-Derby beyond-visual-range (BVR) air-to-air missile. Saab has held talks with HAL to collaborate on the upgraded version of the Tejas Mark-IA. However, HAL has not been able to meet the target of producing eight Tejas aircraft per year. In July 2016, the IAF inducted the first two serially-produced LCAs, followed by two more aircraft in the same year. Twelve more aircraft are currently at the production stage. The Indian government has also been pushing HAL to ramp up production capacity from eight to 16 aircraft per year. India’s defense industry is behind schedule in delivering the country’s first indigenous fighter jet.